BEFORE: The day has finally come. After being released two weeks ago overseas, the latest James Bond film Skyfall, the 23rd in the franchise, has hit the silver screen in the United States. After a disappointing entry last time with Quantum of Solace, I’m very excited to see what may be the best Bond film ever. Pierce Brosnan is by far my favorite Bond but Daniel Craig is pretty high on the list. Casino Royale was a great debut for him and I like the direction he’s taking the character. After listening to the new opening credits song sung by Adele numerous times and getting very excited because Sam Mendes (director of American Beauty among other films) is directing and Q is making a return, I can’t wait for the lights to dim and the projector to start. I hope it lives up to my wildly high expectations, but with the people involved, I’m confident it can be done. AFTER: The advertising said it, I was thinking it, and now I can confirm it: Bond is back. Skyfall is not only one of my favorite Bond films, but it also a great film in general. Sam Mendes does a terrific job incorporating more of a story into the film instead of just focusing on the action but he also caters to the fans and includes many of the best Bond-isms. As any fan knows, there are three main components to a Bond film: the opening sequence, the opening titles, and then the remainder of the film. Let’s start by discussing the opening sequence. There are two things the sequence needs to accomplish: get the audience’s attention and set up the rest of the film without actually starting it. In other words, it’s like a large-budget short film. Skyfall is right on target for all accounts. Bond is chasing down a hard drive full of covert agents all around the globe and this leads to a car chase, motorcycle chase, use of construction machines, and all culminating in a fist fight on top of a moving train going in and out of tunnels. If this doesn’t grab your attention and get you excited for the rest of the film, I don’t know what will. After a surprising, but not shocking, end to the opening sequence, we go to the opening titles, one of the tentpole features of a Bond film. As I said earlier, the song “Skyfall” sung by Adele has been stuck in my head ever since it was released in October. The song itself is fantastic and gives off a Bond feel. Even before the lyrics start you can identify the song as a James Bond opening theme just by the sound of it. The visuals of the titles are another key component as they have a very distinct look. In Skyfall, that look is altered a bit and shows more reality as opposed to the typical abstract shapes and figures. It wasn’t bad but it did take me by surprise a bit to see actual faces instead of silhouettes. I will at this point mention there are many spoilers throughout this film and I will do my best not to ruin anything. Given how many things happen in the film and it having been released for two weeks, I’m surprised I was not spoiled myself and would want to do so for anyone else. With that being said, it’s time to go into the meat of the film. One of the reasons Skyfall is so great is because it is the quintessential Bond film while still being appealing as a film in general. For starters, I’ll cover the many Bond elements Mendes included. Skyfall reintroduces two recurring characters that have been absent since Brosnan’s last film, Die Another Day. Q (Ben Whishaw) returns with only two gadgets for Bond (a new personalized Walther PPK and a radio transponder) but his presence extends beyond that. Where Q really shines in this film is when he’s surrounded by computers and observing the action from afar. I don’t think anyone will ever be able to top Desmond Llewelyn’s portrayal of Q but Whishaw is a great second (he even mentions the exploding pen from Goldeneye, a great throwback for Bond fans). The second recurring character I’ll refrain from mentioning but I will say that there are a slew of other classic Bond references included that I can mention. The Aston Martin makes an appearance, Bond has one martini, shaken not stirred (in addition to a Heineken), and of course the Bond girls. To broaden the scope a bit and how Skyfall is a great film even without the Bond aspect, I’ll talk about the unusual organization and pacing of the film. What I found very interesting is how Mendes releases information. The film’s villain, Raoul Silva (Javier Bardem) is not introduced until more than halfway into the film and yet he is still one of the best (as in most evil) villains ever. The introduction of Silva is just the start of a chain of events that keeps building the suspense and excitement. The first half is by no means boring, but it is entertaining for different reasons, the biggest being controversy surrounding M (Judi Dench) and MI6. Silva is still controlling events and by waiting to introduce him much later in the film, it makes him appear even more evil. 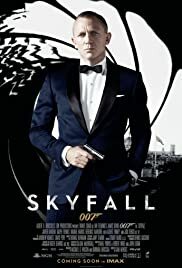 The other interesting choice in terms of organization is the introduction of Skyfall. The title of the film does indeed play a big role in the film, and like the villain, is not introduced until very late into the film, almost two-thirds or more. I’ve been saying that Skyfall is much more than just a good Bond film and what Skyfall means is the reason. It is something that has been lacking in all the previous Bond films and the inclusion in Skyfall starts to introduce much more meaning into a franchise that is heavily reliant on the action, women, and catchphrases. I can safely say that I was not the only one looking forward to seeing Skyfall. At the 10:30 matinee showing on a Saturday morning, the theater was almost full, something I found very surprising. But I think the film speaks for itself and lives up to all the hype. Bond is most definitely back and better before. It certainly appeals to the die hard Bond fans with many references but even for someone who has never seen a Bond film or only a few, Skyfall is still a terrific choice. Sam Mendes brings a whole lot more to this franchise than anyone has before him and I’m very excited to see what’s in store for Bond 24.